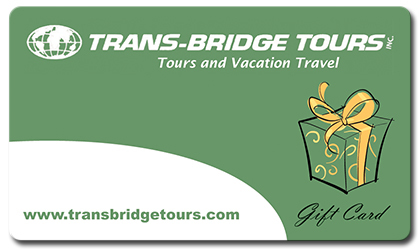 Trans-Bridge gift cards make a perfect gift for any occasion! They are valid for Trans-Bridge Tours’ One-Day, Casino, and Multi-Day Tours; Air & Cruise Vacations, and Trans-Bridge Lines’ New York City, Airport and Pier Transportation. Trans-Bridge is not responsible for any lost or stolen cards.